It’s cold outside. With slippery sidewalks, blizzard winds, and bone-chilling temperatures, it’s tempting to hibernate until spring. But, that’s not realistic. So, the next time you venture out your door, make sure you’re prepared because frosty conditions are dangerous. By following these 10 winter weather safety tips, you and your loved ones can stay happy and healthy until the tulips bloom. Bundle Up — Although this seems like common sense, it’s easy to forget to bundle up before heading out, especially if you can access your garage and car directly from your house. Have you ever left quickly in slippers because you wanted to get milk at the local, drive-through convenience store? 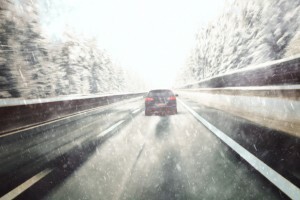 It’s easy to cut corners, but remember cold temperatures can quickly lead to frostbite and hyperthermia, and your toasty-warm car could break down. Hope for the best, but always be prepared for the worst. More than half of hypothermia-related deaths occur in people over the age of 65. So it is extremely important that your older relatives dress appropriately. Put on layers, wear warm socks, a hat, gloves, a coat, and always use a scarf. By covering your mouth, you protect your lungs. For safety, keep a warm blanket and some extra winter clothing in your car. Keep Up Your Spirits — Endless days of dark, gray skies and frigid temperatures can make anyone feel gloomy. If you are housebound with young children or older adults, make sure you reach out to others with a friendly phone call. Or, make plans for a fun event to look forward to. It’s especially important to check in on older friends and neighbors who live alone. Maintain Your Vehicle — Keep your car in tip-top shape to avoid being stranded. Before leaving your house, always check that your cell phone is fully charged for emergency calls. Make sure you check the oil, tires, battery, and wipers. For additional peace-of-mind, you may want to purchase an emergency road service such as AAA. Also, be sure to top-off your tank and pre-treat your locks so they don’t freeze. Watch the Ice — Avoid slipping on black ice by wearing footwear with good traction and non-skid soles. Always remove your shoes/boots when you get inside the house so that you don’t slip on the snow attached to the tread on the bottom. Not only will this keep your floors clean, it will help to keep you upright, too! Avoid Carbon Monoxide Poisoning — A gas heater, fireplace or lantern can lead to carbon monoxide poisoning. As a precaution, check the batteries in your detector to make sure it’s functioning properly or replace the entire unit if necessary. (While you’re at it, check the batteries in your smoke alarms, too.) Also, make sure the chimney vents properly. Remove plants and prune shrubs that could block exhaust. An obstruction can cause carbon monoxide to back up into your home and the heating system to shut down. Get Enough Vitamin D — During the winter months, we spend more time indoors and may eat a smaller variety of food. This can lead to a vitamin D deficiency. Consuming milk, grains and seafood such as tuna and salmon will help to prevent this. Stock Up — Be prepared. Assemble an emergency supply kit for your home and be sure to have 72 hours of food, water, and other necessities. Get a Flu Shot — The best offense is a good defense. Protect yourself and your loved ones, especially seniors, from seasonal influenza by visiting your doctor or local pharmacy for a flu shot. Also, if you take medication regularly, make sure you have extra on-hand so you can “weather” a storm. Avoid Freezing Pipes — Ensure that sprinkler systems are blown out and winterized and that exterior faucets and water lines are insulated. Also, drain air conditioner pipes, and if your air conditioner has a water, shut-off valve, be sure to turn it off. For additional tips on preventing pipes from freezing, read this DIY article. Seal cracks on the exterior walls, especially where utilities and pipes enter. Rodents are able to squeeze through the smallest openings. Replace any loose mortar or weather stripping around basements windows and the foundation. Be sure to store firewood at least 20 feet away. Mice and ants can make their nests in the piles and gain access to your home. Avoid any cockroach infestations by eliminating moisture. Seal leaking pipes and fix clogged drains. Install a screen or cap on top of the chimney to prevent animals from entering in “Santa Claus” style. By following these winter safety tips you’ll be ready for anything nature throws your way. And, don’t fret. All seasons come to an end and before you know it, spring will be here.